Allen Brown’s New Book “The Elevator” is a Riveting and Eye-opening Account of the Main Characters’ Travels to and Through Hell. Recent release “The Elevator” from Page Publishing author Allen Brown is both provocative and dark; this work follows a high school student Jason as he and his guide travel via the Elevator to the bowels of the earth. This work explores the evils of the world and the evils of our society. 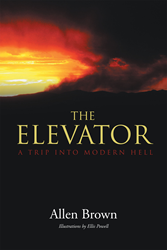 Allen Brown, a husband, father, Veteran, retired electronics engineer and pilot, traveler, square dancer, devoted writer and published author has completed his new book “The Elevator”: a gripping and potent journey into the depths of hell. This book will awaken the fears of readers, inspire the good and guide them through the questions of faith. Published by New York City-based Page Publishing, Allen Brown’s profound work twists intellect, philosophy and religion into a spellbinding novel. Brown asks readers, “Do you want to know what modern Hell is like? Would you like to know where your friends will be in Hell? Would you like to know where you would be in Hell now? Would you like to know how you can avoid going there? This novel is about a high school boy, Jason, winning a writing contest about the evils in modern life. With a guide, Joan, he is awarded a trip on the Elevator to descend into the bowels of the earth and view first-hand the workings of Hell. This novel modernizes Dante’s view of Hell as presented in his medieval classic ‘Inferno’. This new work expands Dante’s nine circles to be fifteen Levels of Hell and includes the fundamental evils of mankind as well as the evils of modern society. This book is not for light, feel-good, vacation, pleasure reading. This is a reference book. This book should be used by clergy of all Faiths, by counselors, by parents, by young people and by old people as a guide to help themselves and others, especially children, avoid wrongful deeds in modern life. Readers who wish to experience this mesmerizing work can purchase“The Elevator” at bookstores everywhere, or online at the Apple iTunes store, Amazon, Google Play or Barnes and Noble.